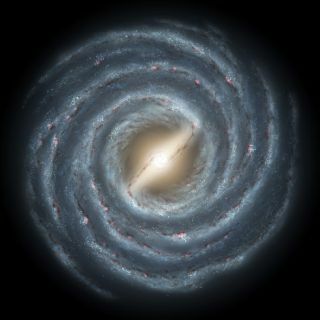 An artist's rendition of the Milky Way Galaxy. "Galactic Tick Day" is a holiday invented to celebrate the sun's orbit around the galaxy. Every time the Earth makes one complete loop around the sun, humans celebrate the journey with some kind of New Year's holiday. So why won't we celebrate every time our solar system completes one loop around the center of the galaxy? Such a holiday may have just arrived: A group of science enthusiasts have established "Galactic Tick Day," which celebrates the journey that the sun takes around the nearly circular disk of the Milky Way galaxy. The Milky Way Galaxy is our home in space. The galaxy contains about 400 billion stars, with a 4-billion-solar-mass black hole at its core. See how our Milky Way Galaxy works in this Space.com infographic. David Sneider, one of the creators of Galactic Tick Day, said the motivation for inventing this new holiday is "kind of loosely defined," but mainly the group hopes it will simply bring some awe and excitement to people's lives. "Hopefully, some people will realize that the sun is in motion, when they may have thought it was stationary before," Sneider told Space.com. "And perhaps for people who already know about this motion and know something about astronomy, if they're educating their peers and their friends … that's also something really nice." Sneider is 26, lives in northern California, and is a self-described entrepreneur and "startup guy," who works on the "commercial, strategy and messaging side of things." He isn't a scientist (there are no professional scientists behind Galactic Tick Day), but he likes discussing big ideas from science — such as when a person on Earth stands very still, he or she is still moving around the sun at about 67,000 miles per hour (110,000 kilometers per hour), and around the galaxy at something close to 514,000 mph (828,000 km/h). This is a fascinating fact, and in Sneider's experience it can lead people to meditate more deeply about their place in the universe. In his spare time, Sneider volunteers with Black Rock Observatory, a group that "brings meteorites and telescopes to art and science festivals in California," which is one of the places where he can discuss these cosmic ideas with people. "All of these scientific facts, when you put them together and start synthesizing [them] it becomes very invigorating," Sneider told Space.com. "Given this expanse and this spaciousness in which we find ourselves — and you can picture in your mind's eye the Earth as the pale blue dot — when you start going down that line you really get these nice feelings and understanding that we are a human family. This is a planetary society. Whether we like it or not we're all in it together. And to be able to have that level of conversation and kind of see people arrive at insights similar to that through science education is really amazing." To celebrate the age of human beings, we have to know the exact day on which they were born. Since the exact birth date of the sun is a bit vague, the creators of Galactic Tick Day had to pick some other specific starting date to start counting the passage of galactic years. (New Year’s Day, for example, is used to mark the passage of the Earth's journey around the sun, but it is essentially an arbitrary date). That day was selected in honor of the "telescope's power" in bringing about "awareness of the nature of the universe," according to the Galactic Tick website. If the sun travels in an approximate circle around the center of the galaxy, then that circle can be divided up into degrees — every circle is 360 degrees. Every degree can be divided up into 60 pieces, each called an arc minute. Every arc minute can be divided into 60 arc seconds. (These units can also be used to measure the distance between objects on the sky). The creators of Galactic Tick Day then divided each arc second by 100 (a "centi-arc second"). Sneider said they call each of these centi-arc seconds a "tick," sort of like the tick of a second hand on a clock. Every time the sun completes one centi-arc second in its orbit around the galactic center, they will celebrate Galactic Tick Day. Because it happens every 633.7 days, Galactic Tick Day won't fall on the same calendar day every time it comes around. Fans of the holiday will have to calculate when the next celebration should be. Galactic Tick Day is a great celebration of science, and it is also an example of how social media is making it possible for just about anyone to kick off their own science outreach projects. Sneider and his friends aren't affiliated with any science organizations; currently, they don't have any celebrities (scientists or otherwise) pushing their message out. (Sneider did reach out to multiple science news outlets, including this one, and there's been some coverage). A YouTube video describing the holiday has a few thousand views, and a Facebook event page (location: Earth) has been shared by a few hundred people. "It's just an idea … It's successful if people are talking about it," Sneider said. "I'm actually pretty surprised to see how excited people are getting about it. The fact that we're having this conversation, to me, is amazing. 'Cause initially in starting it, the thought was this can be a long-term project. It took the founders of Mother's Day about two to three decades to get that going. And you know, if this has some iota of traction in the next 10-15 years, I'll consider that a success." Editor's Note: This article was corrected to show that Sneider's first name is David, not Daniel.